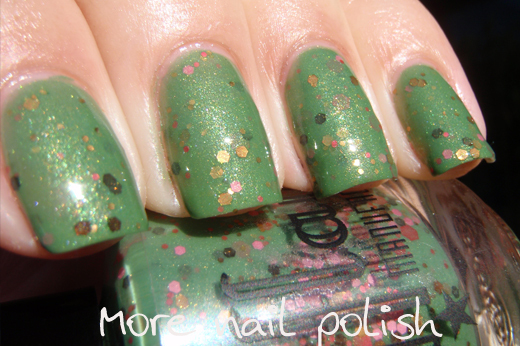 Here is the second installment of the Scofflaw Nail Varnish collection. Love Letter To Bea Arthur - this has a dusty purple pink base with dark plum, gold, and fuchsia flakes. 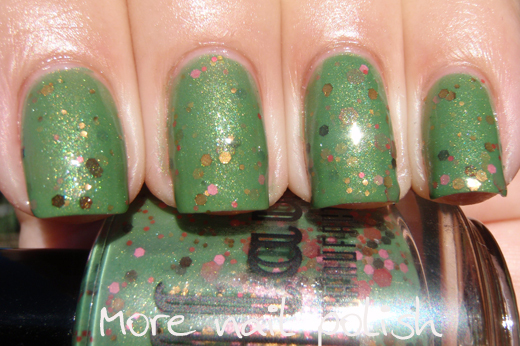 That's right, this isn't a glitter polish, it's a flakie! The formula was smooth and easy to apply. 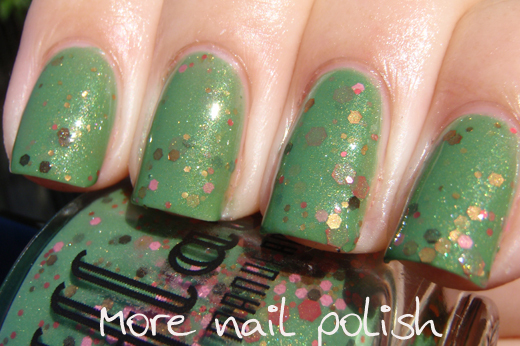 I chose to wear it on it's own and used three thin coats with Seche Vite top coat for this look. Its a very pretty and neutral shade, but has that extra pop when in brighter light. Sturm Und Drang - has a dark steely grey base with a silvery blue shimmer and sparks of holographic micro glitter. There are also aqua, silver, gunmetal, lavender, violet, and lime green hex glitters in different sizes. This is two coats with Seche Vite top coat. Wee Beasties - hummmm I have two wee beasties at home a two and four year old, but now that I've googled Wee Beasites I see there is also a punk rock band from Texas and its also a term used to describe those little aquatic insects that live in fresh water ponds and swimming pools. Their real name is "water boatmen" and we've always called them "swimmers". Anywho - no idea which of those this polish is named after, but I can tell you it has an army green base with strong copper/gold shimmer. 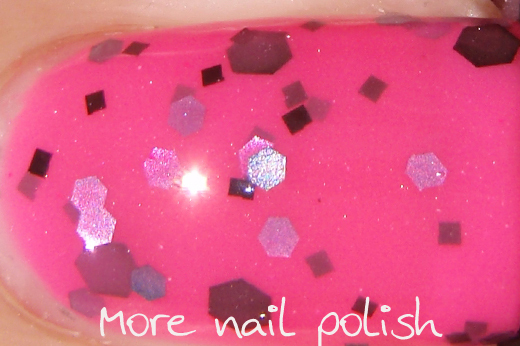 It has copper, brown, and a few different shades of pink hex glitters in various sizes. This was two coats with Seche Vite top coat. Whiskey Tango Foxtrot - this one is a bright teal jelly base and contains red, white, gold and brown glitters of various shapes and sizes. 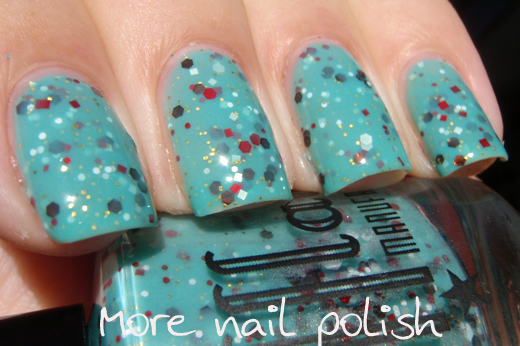 Delightfully swishy, this one is a true jelly which can been easily seen through to see the layers of glitters. But it's also easy to build to opacity on its own. This is three coats with Seche Vite top coat. Thunder Kitty! - ok, I know I definitely have some thunder kitties at home. You know what I mean. It's 2am and your fast asleep in bed when you're suddenly woken by one of your kitties thundering down the hallway at break arse speed for god only knows what reason. A friend of mine called these moments that cats have, the PPCs, aka the Post Poo Crazies. Sorry, I got sidetracked again on the polish name. 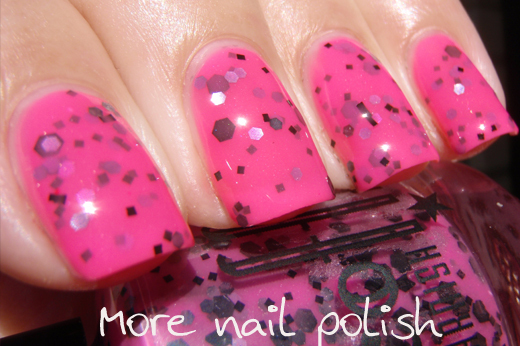 Thunder Kitty is a bright neon pink nail creamy jelly that contains black and gunmetal silver glitters. This is two coats with Seche Vite top coat. 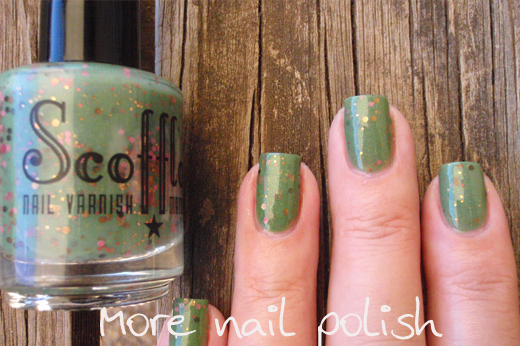 What do you think of the Scofflaw nail varnishes? I'm a fan. I love that they are versatile in that you can easily wear them alone or you can wear one coat layered over another polish. 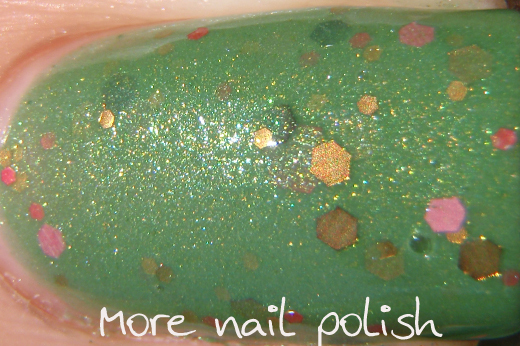 All the formulas were great and one thing I particularly noted was that the glitters seems to stay suspended beneath the surface of the polish meaning only one layer of top coat was ever needed. 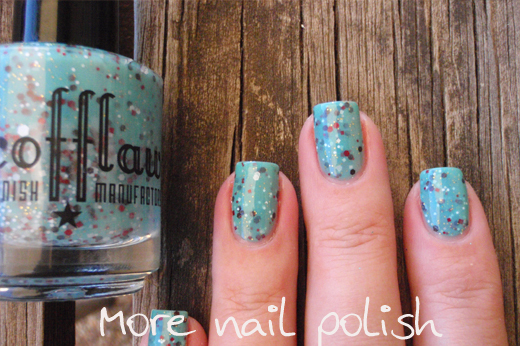 Scofflaw nail varnishes are available from Llarowe for $11USD. Some are in stock now, but I notice a lot sold out since my last post. If I enabled you, YAY you wont be disappointed. I Love them! The colour combos are really unique. I had to have a chuckle about your description of the Thunder kitty bolting down the hallway at 2am. I am very familiar with that scenario at our place too, except our 2 also decide to fight with each other at that time of night and make one hell of a racket haha! I really want Whiskey Tango Foxtrot now! It looks amazing and it's so unique too. Gorgeous swatches! I really like the depth to jelly glitters. Love Letter to Bea Arthur and Whiskey Tango Foxtrot are the two standouts for me. oh my wallet hates you lately. Gorgeous photos and thanks so much for the shout out! These definitely call to me. I find them to be unique. Love Letter to Bea Arthur is the standout for me. Thanks for sharing! FNUG Holographics & Urban Look.